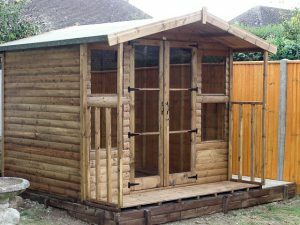 Chalets » Sussex Timber Products Ltd. 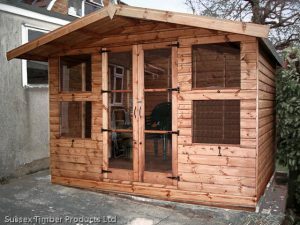 The Chalet is available in the apex roof type, with two types of cladding - T&G Shiplap and T&G Loglap. All fixtures and fittings, fixings, roofing felt and glass are included for D.I.Y installation. Prices are listed below, if you would like us to install your chalet for you. Extra heavy duty bearers are also available if required. Joinery made glazed double doors. Apex eaves height: 6'0" (1830mm). Apex ridge height: 7'0" (2130mm). Door: 4'0"(1200mm) x 5'9"(1800mm) glazed doors. All prices quoted included V.A.T. at the current rate. Delivery costs within the following post code areas are included within the quoted price : TN, BN, RH, ME, DA, BR, CR, SM, KT -for costs in all other areas please refer to the Delivery Map. installation service prices quoted apply to delivery zones A-D, zones E & F are P.O.A.